Developed and Published by Thekla Inc. Released on January 25, 2016. Available on PS4 (reviewed) and PC. Review code provided by publisher. When we talk about Jonathan Blow's Braid, we usually discuss its time-warping mechanics, charming artwork, or open-to-interpretation story. But at its core Braid was always about puzzles - unique, brain-bending puzzles that forced you to look at each level in strange new ways. 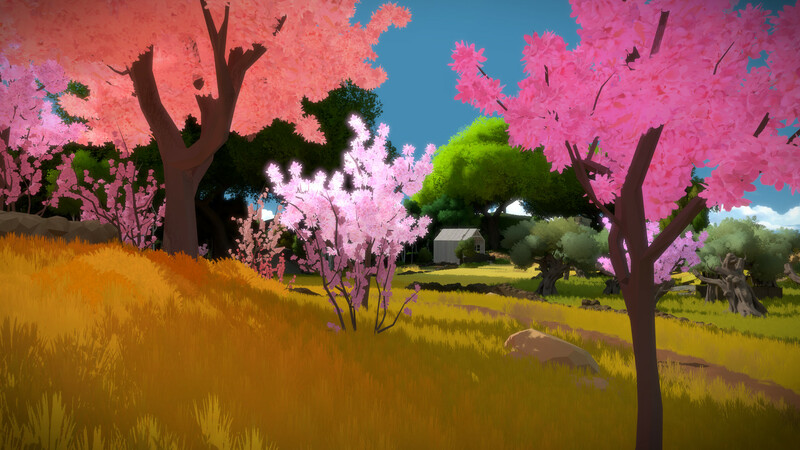 On that score, The Witness isn't so different from Braid at all. I'll remember it for its pleasing visuals, and its new take on the "walking simulator" genre. But The Witness's real meat comes from puzzles, each expanding a portion of your brain that's lain dormant since Braid. 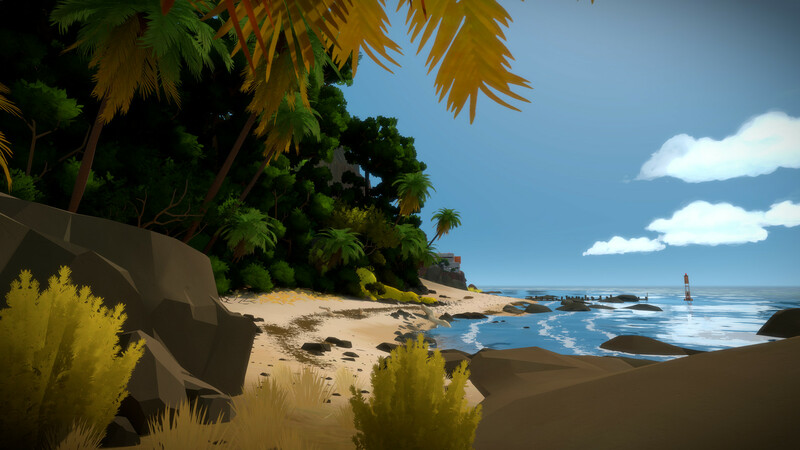 The Witness takes place on a huge, seemingly abandoned island. You'll wake up in one of its underground chambers with no clue how you arrived, or what is going on. All you know is the island is filled with hundreds of puzzles, mostly displayed on out-of-place digital screens. Many puzzles are connected to each other via electronic cables, and activate new challenges or unlock new environments when completed. Over time, these puzzles start directing you to a mountain in the center of the island where the answers to your questions may finally be revealed. Completing puzzles initially seems very simple: you trace a single line from a start point to an end point. The line cannot cross over itself, but it can reverse directions as you test various approaches to the exit. However, there is a twist: each puzzle has secret rules unique to their environment. The Witness won't give you clues to these rules, so you will have to piece them together by studying the puzzles and your surroundings. Like any good puzzle game, The Witness starts off easy before gradually moving into insanely complex challenges. Your starting puzzles are simple mazes where you trace a path to the exit, sometimes requiring your line to touch every black dot. Some create secondary lines that mirror your own and also cannot be crossed. Many puzzles have no clues at all, forcing you to recreate designs from the game world around you. Anytime you think you've finally grasped The Witness, it hits you with new rules that completely change the experience. Figuring out those rules is the real challenge, and is both its most rewarding and frustrating element. Then you have the island itself, a peacefully scenic landscape that encourages you to work on the puzzles at your own pace. It's an open world filled with trees, rivers, and plains of vibrant colors, all of which are beautiful to explore. It lends The Witness a strong calming effect, which is helpful - it's hard to curse and rage at incomprehensible puzzles when you turn your head and see a beautiful naturescape. And when a puzzle gets too hard, you can usually walk away and find something else to distract your attention. 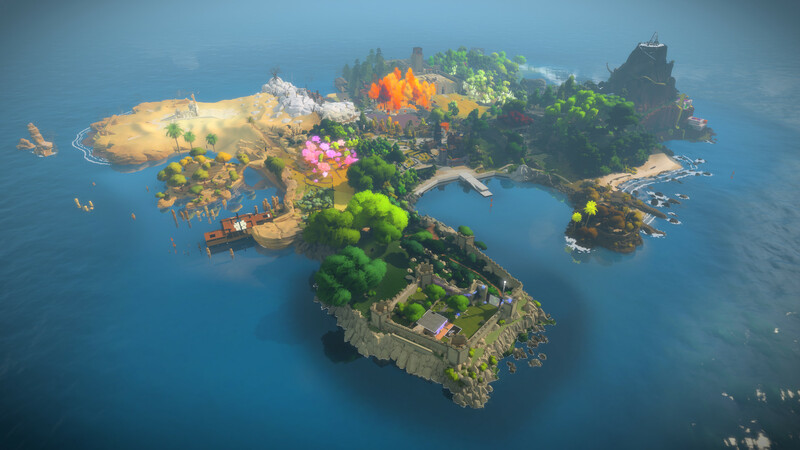 Some may accuse The Witness of being a "walking simulator", since the island doesn't fit well stylistically with the digital puzzles and screens. Why design an island at all, when the puzzles could easily fit on a smartphone screen? The truth is that they subtly reflect each other, and you can't have one without the other. Several advanced sections require observing to the natural world for clues, not the screen. 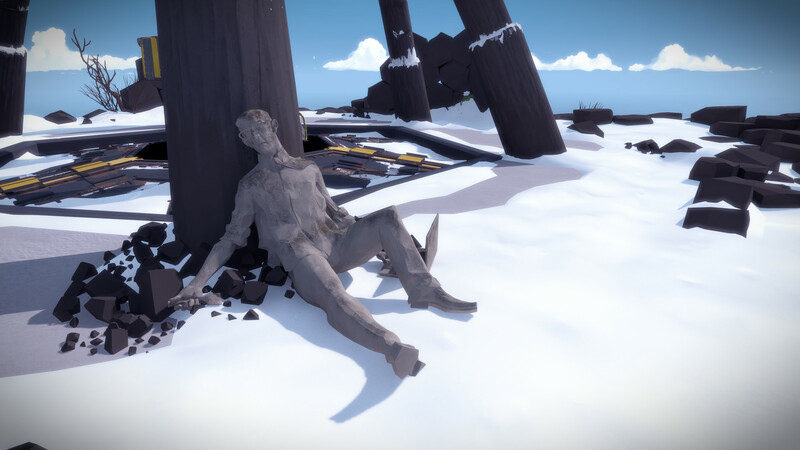 Other puzzles abandon the screen altogether to explore life-sized recreations laid over the environment. One particular puzzle even had auditory hints that I missed for a half hour before picking up on them. The island itself also teases out a history as you explore its varied locations. Signs of civilization occupy varying states of disrepair. Some puzzles themselves are broken or warped from age, making them all the more challenging. And then there's the statues, scattered across the island in uncomfortably natural positions. Were they placed there by whoever created the screens? Were they living members of a puzzle-based cult, cursed to stone by their dark god? The story of the island is the biggest puzzle of all. A final word of warning: You, like me, may not actually be able to fully complete the game. Many of its puzzles are hard. Excruciatingly hard. Almost unconscionably hard. 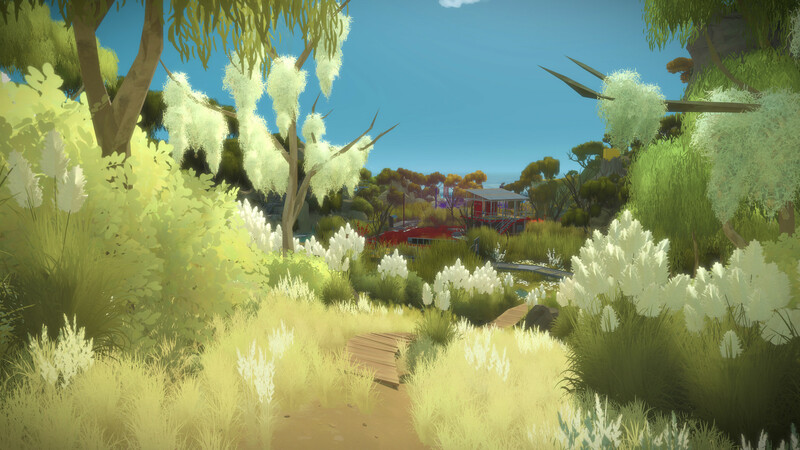 The Witness asks a great deal of players, won't hold your hand, or give any easy solutions. While that makes solving puzzles feel all the sweeter, it also means when you're stuck, you're completely stuck. The good news is that you don't have to solve every puzzle to finish the game, and you can usually wander off to work on others when you're stuck. But not always. Just as solving puzzles sometimes unlocks new areas of the island, it can also seal off areas behind you. This happened to me at one point, trapping me in an enclosed space with a puzzle type I'd never completed before. The main exits were locked behind these puzzles, and try as I might, I couldn't understand what they wanted from me. Backtracking is normally an option, but here it required solving a previous puzzle in a different order - another example of The Witness' obtuse logic. And thanks to a single, always-running autosave, the most obvious exit was to restart the entire game. You never have to restart, as The Witness has no fail state, but sometimes it feels like the easiest option. 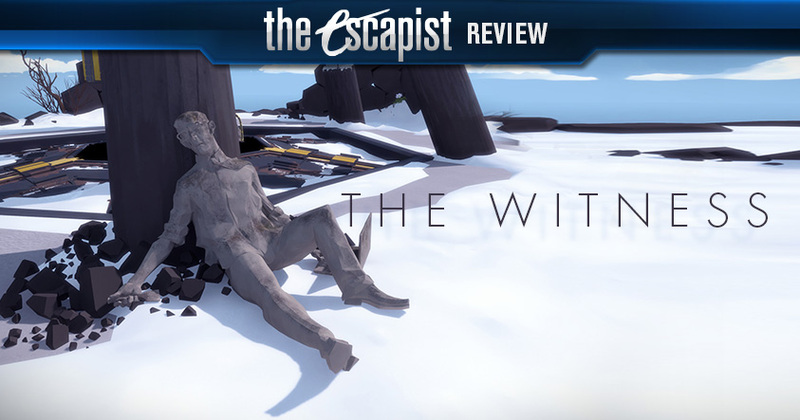 As frustrating as the experience might be, it's hard to fault The Witness entirely for that. While we have all kinds of puzzles and exploration games, this is a highly unique blend, the likes of which haven't been pulled off so naturally since Myst. It's challenging, it's rewarding, it's beautiful, it's frustrating, and it gets into your head in that wonderful way only games can. Whether you blaze through its puzzles, or slowly to struggle with them for hours, The Witness is undeniably worth playing. 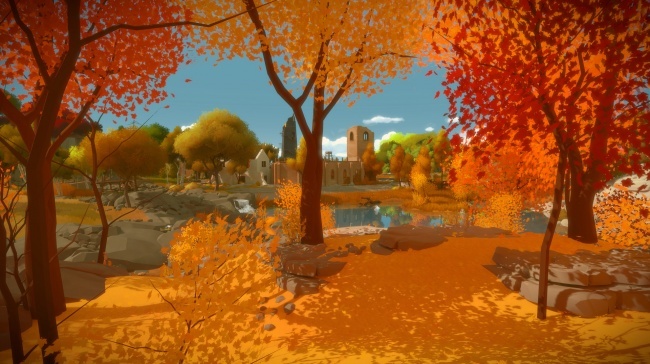 Bottom Line:The Witness is a beautiful, brain-tickling, "puzzle-adventure," that will manage to both frustrate and awe you at the same time. Recommendation: If you love puzzles, exploration games, or simply something off the beaten path, The Witness has it all.